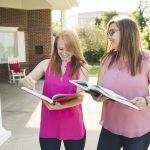 Alpha Sigma Alpha promotes high ideals and standards for its members throughout their lives by emphasizing balance among our four aims of intellectual, physical, social and spiritual development. The principles and ideals upon which our organization was founded are present in everything we do, and our members, chapter programs and initiatives reflect these commitments every day. As individual members, we commit to being women of poise and purpose, every day. We promise to live by the core values and maintain high standards knowing it is our actions that build a strong legacy for our sisters. As a chapter, we commit to serving our members. We promise to be an energizing influence in the future of our chapter, its women and its legacy. We commit to cultivate and foster women of poise and purpose throughout their lives. Alpha Sigma Alpha recognizes and honors its collegiate members in a variety of ways. Your shining example is what inspires your fellow sisters and we believe in rewarding those that do good for the world around them.